Vijayadashami in celebrated throughout India, under different names and with regional variations, as the victory of good over evil. 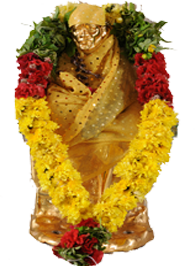 For Sai devotees, it is venerated as the holy day that their beloved Gurudeva(Saibaba) attained mahasamadhi (also known as Punyatithi) and is a big festival in temple. Ramchandra Patil became seriously ill. He tried all remedies, but finding no relief despaired of his life was awaiting for the last moment. Then one midnight Baba stood near his bed. Patil held His feet and said,” I have lost all my hopes. Please tell me definitely when I shall die”. Merciful Baba said,” Don’t be anxious, your Hundi (Death-warrant) has been withdrawn but I am afraid of Tatya Patil. He will pass away on Vijayadashami of 1918. In Vjayadashami is performed well as with special programmes of Sai Punyatithi.